How Sylvester Stallone could follow in the footsteps of Ving Rhames. When it came time to hand out that year’s Golden Globe for Best Actor in a Miniseries or Television Movie, the category presenters were Alan Rickman and Jada Pinkett Smith. It is of course Smith this season whose articulated feelings kicked the #OscarsSoWhite juggernaut into high gear. So here’s what we’re thinking. On the night of Sunday Feb. 28, when Sylvester Stallone inevitably wins Best Supporting Actor for Creed, he will have arranged to have Idris Elba in the wings. And as part of his acceptance speech, he will call Elba on stage and share the moment. It would be a twist on the Ving Rhames–Jack Lemmon golden handoff that occurred Jan. 18, 1998, one that would allow everyone in the Dolby room to exhale and cheer. Coincidentally, Pinkett announcing with delight the name of Rhames as the winner came just a few weeks after she had married Will Smith (on New Year’s Eve, 1997). 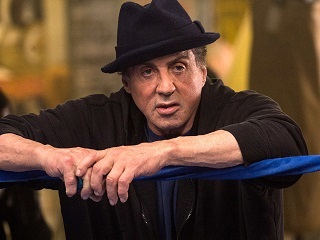 We are humbly proposing a boxing-drama moment to boxing-drama moment; one that does not need to involve Stallone giving over his statuette to Elba (as Rhames did with Lemmon), but rather just framing the great performances of his four fellow nominees and one, symbolic other to defuse this awards season’s false non-equivalency. If this happened, it would unfold 62 years after the first NTSC color televisions were sold to the American public. A writer can dream for a sequel to their all-time favorite awards show acceptance speech, right?